The Christmas season is the perfect time to spread holiday cheer…AND free gifts! Lots of exciting presents for you in this giveaway–be sure to enter for your chance to win this amazing prize package right before Christmas! 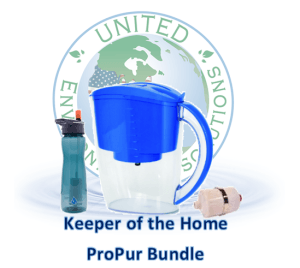 The mission of United Environmental Solutions is to provide quality products worldwide that can be used on a regular basis; but by virtue of their unique characteristics, they can also be used to provide relief in the event of an unexpected emergency. We operate under a simply philosophy: give the customer more than they expect. You can read a full review of the Berkey and United Environmental Solutions HERE. 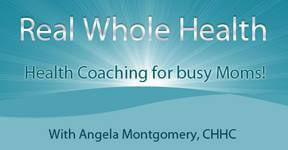 Angela Montgomery of Real Whole Health is a certified holistic health coach who works with busy moms to create a plan to help them reach their health and weight loss goals, naturally! 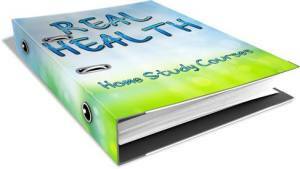 REAL Health home study courses give you the tools you need to: ñ Achieve your optimal weight and have the body you love ñ without yet another restrictive diet that does not deliver lasting results? ñ Finally end your battle with sugar and coffee ñ using strategies that get to the root cause of your cravings so it ceases to be a constant struggle that you canít win? ñ Have all the energy you want, so that you can juggle all your responsibilities without sacrificing your passion? ñ Have the mental clarity that will bring you focus, efficiency and productivity? ñ Attain emotional balance so that you (and your relationships) are no longer held back by mood swings and bouts of depression and/or anxiety? Have less stress and more rest? Health Coaching giveaway description: Work with Angela to discover the best way for you to reach your health and fitness goals with a plan that is tailored just for you! One month of health coaching includes two ñ one hour phone calls with unlimited email support. Our 4 oz. 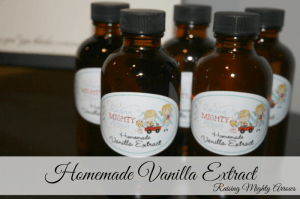 bottles of homemade vanilla extract is made from pure Madagascar Bourbon Vanilla Beans. Itís strength is much more potent than what youíll find on the shelf at the grocery store. In fact, you can get twice as much out of your bottle by using half of the amount of vanilla extract that a recipe calls for. 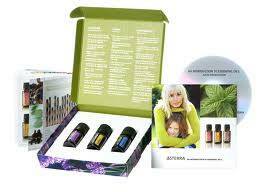 Learn about the amazing health benefits of Essential Oils through the doTERRA Introductory Kit. There are over 101 uses for these three oils and Lindsay @ Crunchy Savings to happy to help you learn about the health properties of Essential Oils. 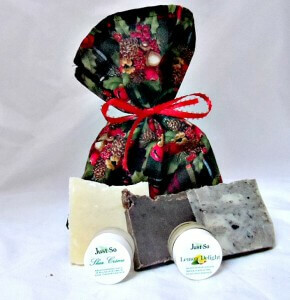 The Just So Sampler makes an ideal gift for those who are chemically sensitive or who are interested in natural living. 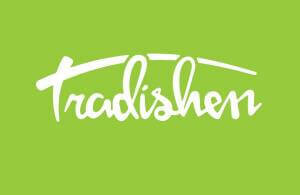 We include 3 samples of our Luxury Soaps, 1 Lip Balm, and a sample of our Shea Creme. The Just So Sampler is packaged in a reusable festive bag. Soaps are packaged in 100% natural muslin bags. 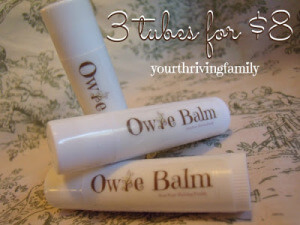 Lip balm and Shea Creme come in reusable glass jars. This is the ultimate natural gift! 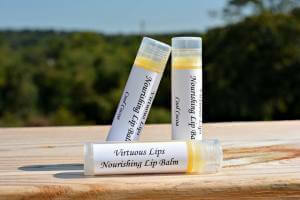 From the lovely Danielle at More Than Four Walls: Virtuous Lips Nourishing Lip Balm is hand made with natural ingredients. Nothing you canít pronounce, just pure simple ingredients. 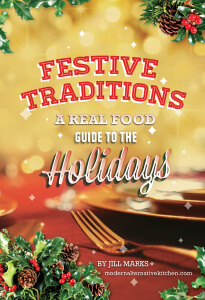 Festive Traditions is a wonderful collection of real food holiday favorites. You’ll find appetizers (perfect to pass at a party), main dishes, drinks, and even desserts! Many selections are gluten or grain-free and appropriate for allergy sufferers or those on special diets. With Festive Traditions, you can enjoy your holidays without the junk! There are few joys in life quite like gathering friends and family around the table for a special meal. One of the best parts of making good food is being able to share it with others. With a little bit of thoughtful planning, it can be effortless to entertain your guests and host an incredible meal. However, the true art of paleo entertaining is creating a delicious and satisfying menu that will also promote good health. 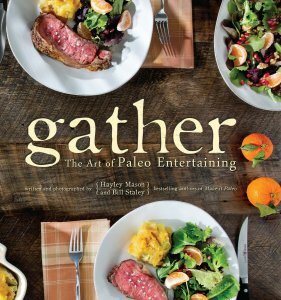 In Gather, the Art of Paleo Entertaining, Hayley and Bill show you how to orchestrate the perfect dinner partyówhether you are planning an elegant holiday feast or hosting a casual brunch with friends. 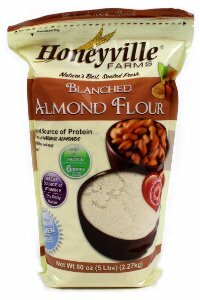 Honeyville’s Blanched Almond Flour, or Blanched Almond Meal, is a great way to cook with limited carbohydrate intake. With a fraction of the carbs of wheat flour, almond flour provides a hearty flavor and consistency without adding all of those empty calories. Chock full of protein and dietary fiber, almond flour works well in a wide array of recipes. Made from blanched almonds, pressed into fine particles, our almond flour adds color, texture, richness, flavor, body, and binds ingredients in baking applications. Bobís Red Mill Natural Foods is an employee-owned, distinctive stone grinding miller of whole grain natural foods. We offer the widest selection of natural and gluten free flours, cereals and mixes. Our RealSalt Seasoning Gift Box packaged in an attractive wooden crate with ìRealSaltî screen printed on each end contains one 4.75 oz. shaker of RealSalt, one 4.75 oz. Organic Garlic Salt, one 4.75 oz. Organic Onion Salt, and one 4.1 oz.Organic Seasoning Salt. The 4 oz. 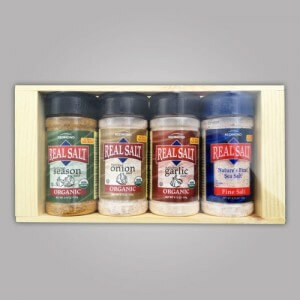 Organic Season Salt gift box makes a great and flavorful gift! Cowgirl Dirt Eye Shadow Trios beautifully pairs three eye shadows giving you contour, highlight, and base shades. Try our subtle trios to enhance your natural beauty and our bold trios for special occasions. Each eye shadow color can be enhanced by dipping our Eye Shadow Brush in water before application. Shea Butter, Virgin Coconut Oil, Beeswax and Jojoba Oil then added Lavender, Rose Hip, Neem, and Melaleuca Essential Oils. These butter, beeswax and oil all promote moisture and healing. Essential oils heal and soothe irritated skin. And as a bonus you can use this as a lip balm in a pinch. This giveaway is open to only those 18 years of age and older and for those living in USA and Canada.